'The Farm House', the Clarkson Runyon Jr. estate designed by Mott Schmidt c. 1917 in Glen Cove. Runyon, a member of the New York Stock Exchange for 45 years, was a partner in the firm of Carlisle, Mellick & Co. and eventually its successors, Carlisle & Jacquelin. Runyon was also vice commodore of the St. Regis Yacht Club on Upper St. Regis Lake where he had a summer home. Click HERE to see 'The Farm House' on google earth and HERE on bing. Photos by James Hogarty. Not a bad house but not a great house either (my opinion) – it looks well maintained & I hope the floor plan is comfortable. What is curious to me is how the real estate around this house lays out – it almost looks like this house owns the vacant land across Meadow Spring Lane, which in the front must give it a very nice feel of being out in the country … a good feel for a place called ‘The Farm House.’ & there is ample real estate on either side to make the environment feel roomy. But, regrettably, it looks like some owner of this house has sold off a chunk of land in back that has been turned into Dalex Court, where duplexes have been built, one of which is looking straight at the back of this house. It does not bode well & backing off & looking at the Meadow Spring Lane / West Drive loop it’s clear “The Farm House’ is part of a small island of old large houses on acreage that are now totally surrounded by commercial development & much less expensive housing on small lots. Now it’s a matter of every owner not subdividing any further for the survival of all. Me, I wrote that ... & then can't even type my name before hitting 'publish.' So starts my Monday. Meadow Spring,in which the Farm House sits is a very early, and very well designed "development" of substantial houses of 1920 or so vintage on relatively small parcels of land. It is exceedingly well laid out, however, and the effect is far more bucolic and private than the the Bing or Google views indicate. When I first knew The Farm House, it was owned by Carl Holmes, a Fleishman's Yeast heir, and his wife Bubbles, a wonderful old broad of the retired show girl variety. The Holmes' spent their winters in the Bahamas. They built the small house to the left and perpendicular to The Farm House to house the 10 servants who came with them from the Bahamas each spring. All of the property to the right of the swimming pool was given over to one of the largest cutting gardens I had ever seen. The Holmes' had moved from a much larger house, taking with them a dozen or so Weeping Hemlocks which still grace the gardens of The Farm House. They also took with them Pre- World War II standards of housekeeping. It was quite a treat to go there for dinner and get a glimpse first hand of how life was once lived. I am lucky enough to know the current owners of the house. Its mistress is one of the chicest women I know and the house is maintained impeccably. I hope that Otto is OK and that all your readers survived Irene relatively unscathed. I stayed in Manhattan this week-end and my most dangerous encounter was with 300 or so angry Upper East Side woman at our local gourmet store (the only market opened) on Saturday morning. The land in front of the house is "communal" land and part of what makes Meadowspring seem so countrified (there is also a large field at the entrance). The property that is developed behind the house was never part of the original property. Again, though, the Google and Bing views are deceptive. When you stand on the property, you have no idea how close your neighbors to the rear are. it is truly landscape design at its finest. I think this house is marvelous ! What a treat is was this morning opening up this site to find a nice hidden secret. A gem that seems untouched by progress. Cheers to the current owners!! You're a brave New Yorker, Magnus. One angry Upper East Side woman in my store is enough to send me running for cover, let alone 300. The storm pretty much fizzled out by the time it got here, although the power, inexplicably, went out for seven hours. No trees down, no windows blown out, and lots of iron lawn furniture taken in, only to have to be put out again. I guess I am the only one that regrets the "Home Alone" entrance with the suggestion of the two eyes, nose and mouth. It would be an easy fix, however. What's on that stone above the front door? Some sort of crest? Thanks for the information Magnus; it’s too bad this type of development wasn’t continued in each direction because it is a very good layout & I’m sure the residents appreciate the rural feel. But that vacant lot on Dalex Court still looks like part of former estate grounds with the tree line & lawn; I just attached it to the nearest estate. I missed what you saw Classicist; but you are correct that it could be easily & discreetly altered … if the owners wanted. Ancient, it does look like a crest above the door. I meant to say earlier I like those striped awnings on the back patio; not something you often see anymore but a really good look. Magnus can you go trick or treating in the neighborhood and fill in the blanks? Would have been nice if they kept that development up. I have to say that I like this house. 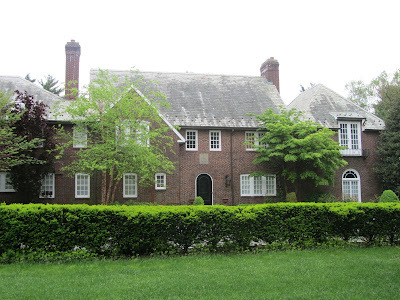 It is a departure from the Mott Schmidt houses I have seen before, a touch of Lutyens. I wonder if the ceilings are low though? Late to the party but I do like the planned and restrained development around this property. Far more sympathetic in its use of greenspace as a buffer to benefit everyone. The neighborhood homes look to be large but not over the top and cohesive. We'd all love (ok, maybe just me) a stone Cotswold village that absorbs the space but uses clustering and small, charming irregular structures and open sheep meadows. If you want to see another sympathetic planned offering see Harrie T. Lindeberg's design for the Armour family ("Tangley Oaks") which is today a wine importer's HQ. The lands around it were developed for smaller private homes hidden in deep woods. The lovely brick mansion serves as the centerpiece. We lived in Meadowspring for over 20 years. The road is a circle, and in the middle of the circle are three homes. We lived in the one that appears just to the left of the open area that you see in front of the Runyon (or as we knew it the Holmes) house. Our home was designed by Harrie T. Lindeberg c1910 for one of the Bourne family (Singer sewing machines). It appeared in Country Life in America in the 1920s when it was owned by James B. Taylor. 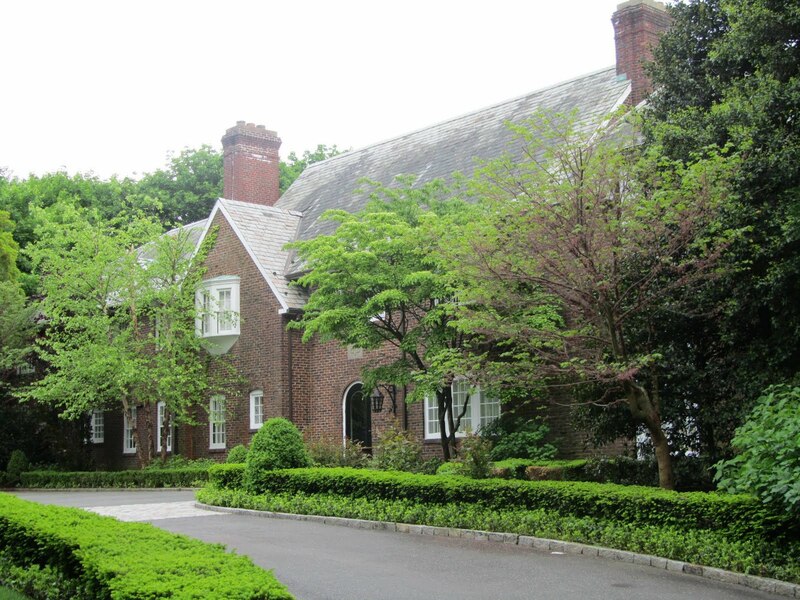 It also appears twice in Long Island Country Houses and Their Architects 1860-1940, misattributed in each case. 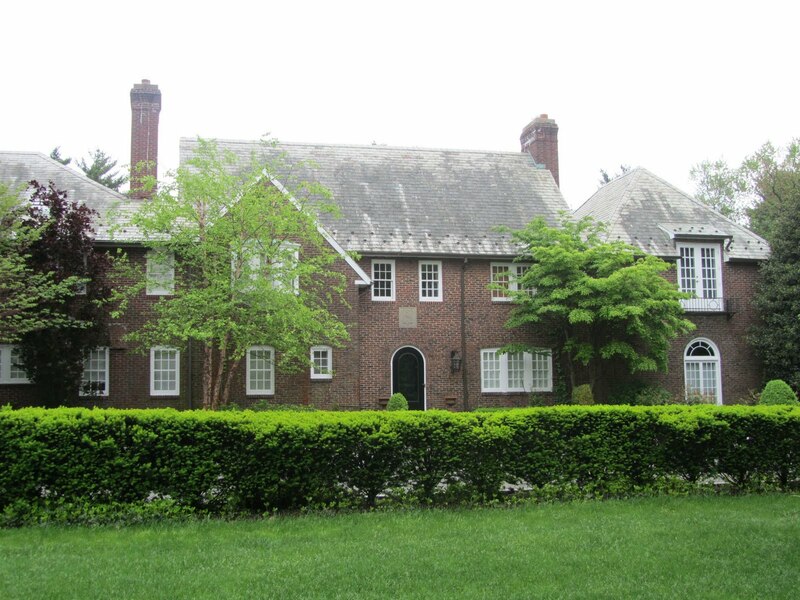 On page44 it is listed as the Taylor residence built in 1920, which was probably inferred from the CLA article. 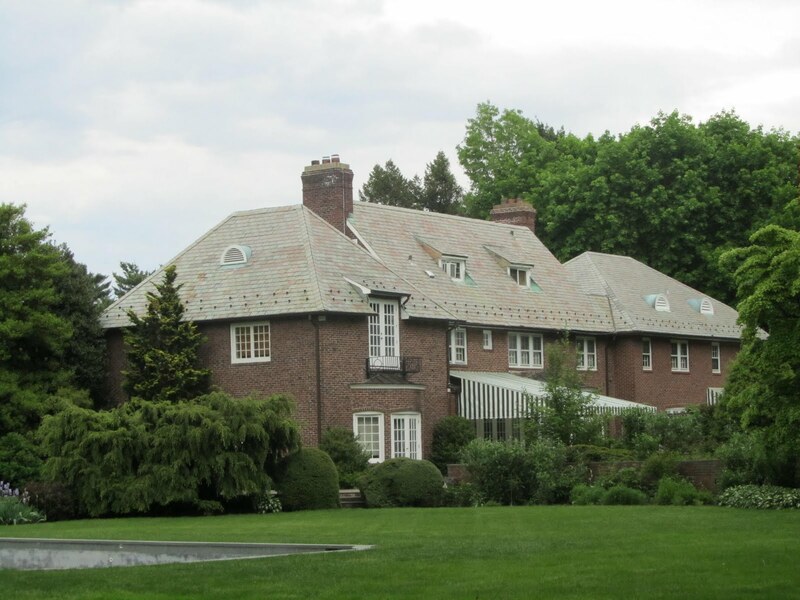 On page 45 it is referenced as the George Bourne residence, which it was, but is listed as being in Mill Neck, which it is not. When Meadowspring was developed it was accessible not only from Duck Pond Road, as it is now, but also from Elm Ave. via an access road that ran alongside the the Runyon property. Sorry to be so long-winded, but we loved living there. HalfPuddingHalfSauce - that's it. It's a French country style house, sometimes mischaracterized as cotswold. It is probably the smallest house in the Measowspring complex, which was marketed by Henry Batterman through Barwin Realty. Meadowspring was unusual for its time as it was formed as a corporation and homeowners were given shares in the corporation in proportion to the lot size. The smallest lot was 2 acres and entitled to 5 shares of stock. It was an'exclusive" community and until late in the last century prospective buyers had to provide a C.V. for approval by the residents, the corporation having right of first refusal on any sales. I live in the Bahamas and spend my summer at the Holmes residence, my father was his personal butler/chauffeur up until the time of both their passing. I spend the better part of my child hood on the property and were very good friends with the Kelly's boys Timmy and Charlie.